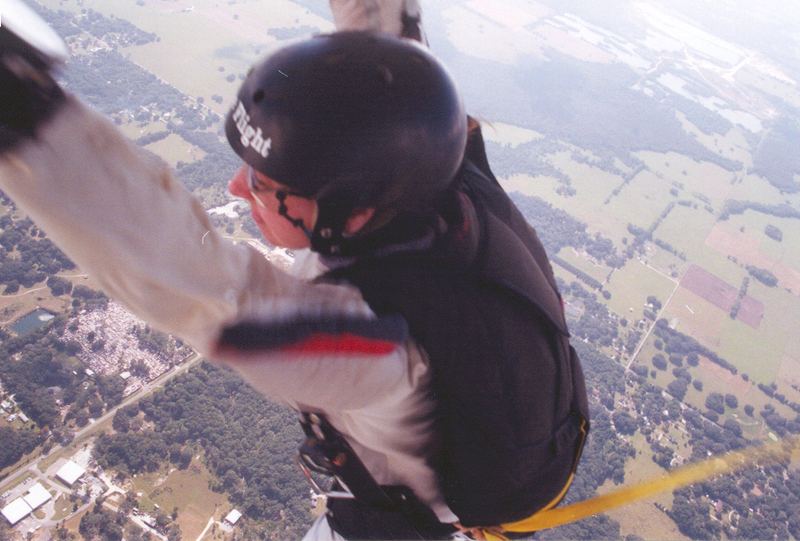 Click HERE for general information about learning how to skydive! 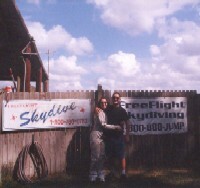 Sam's first skydive was a static line jump from 4,000 feet. 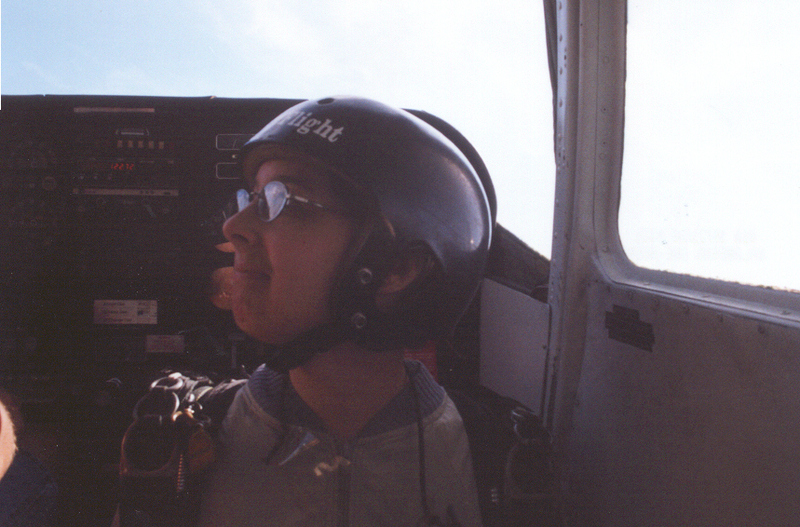 (I was flying the jump plane.) The following 11 pictures were all either taken by me or by Frank Arenas, her instructor. Click the thumbnail images below to view them at full size. 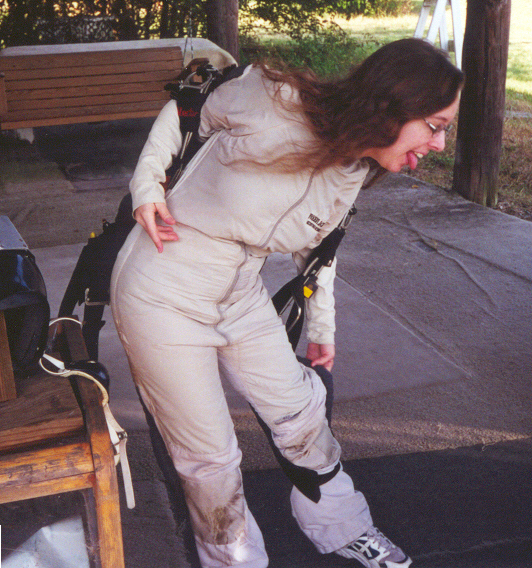 For decades, this training system has been used to teach people how to skydive. The jumper leaves the plane and a "static line" attached to the aircraft automatically and immediately activates the jumper's main parachute. 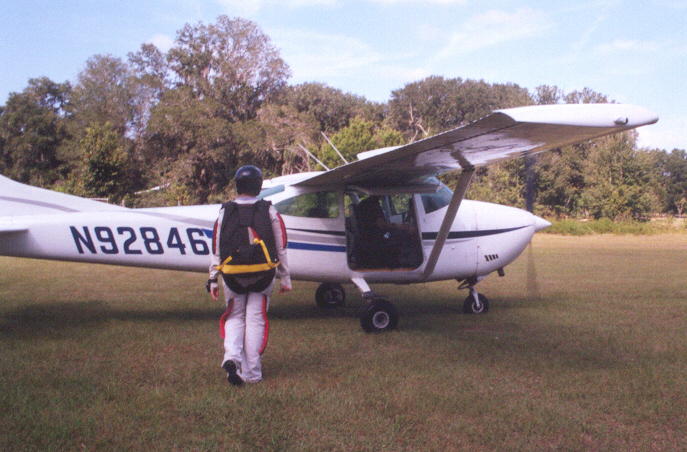 This way, the jumper learns (1) how to climb out and get in position, (2) how to exit in the proper stable arched body position and (3) how to fly and land a ram-air parachute without having to learn basic freefall survival skills at the same time. 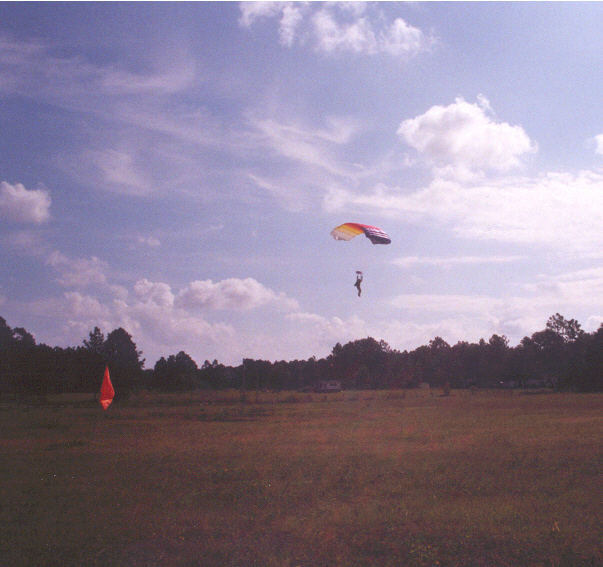 Once the student is comfortable with these three elements, he or she can transition to high-altitude freefall training with less stress and anxiety. Frank shows Sam how to do a thorough gear safety check before donning her rig. 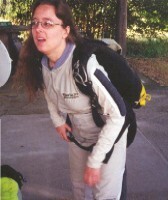 As she shrugged the rig up onto her shoulders, tightened her harness straps and grimmaced, we explained that student gear is much bulkier and more unwieldy than the smaller, lighter gear used by experienced skydivers. "I hope so," she muttered. Sam is ready for this! Look at that face. 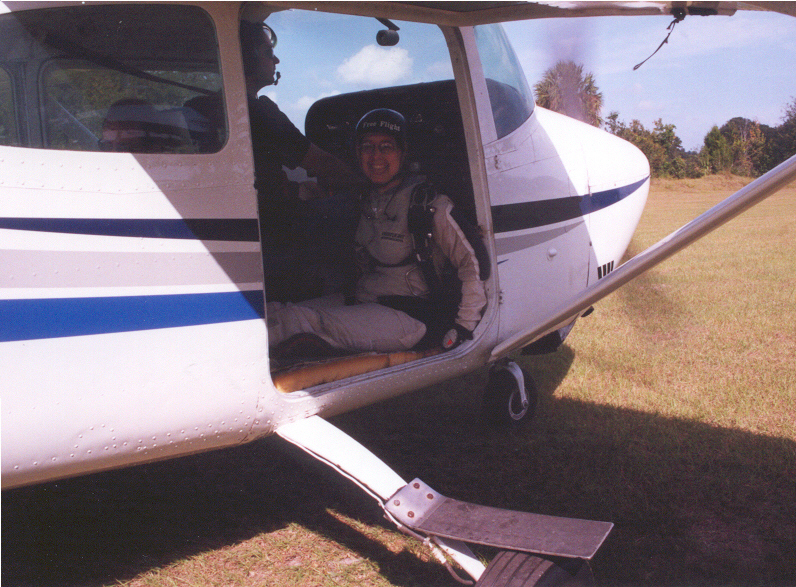 You can see me in the pilot's seat. 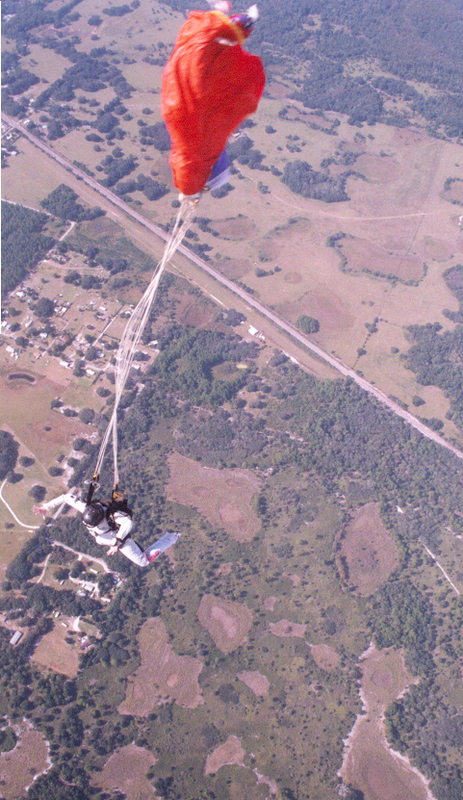 She hangs from the strut, right after her climbout and right before her exit, four thousand feet above sunny Coleman. What a determined expression! "Go!" 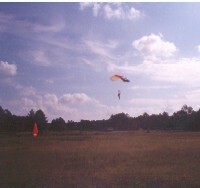 Her main canopy, a Falcon 235, emerges cleanly from the deployment bag about one second after she exits. The time she spent practicing in the SkyVenture Orlando vertical wind tunnel really paid off -- her body position was almost perfect. If you look carefully, you can see FreeFlight's 4,200-foot turf runway in the background. It runs parallel to the railroad tracks. The square field at the upper left of this photo adjacent to the southern end of the runway is the drop zone's landing area. 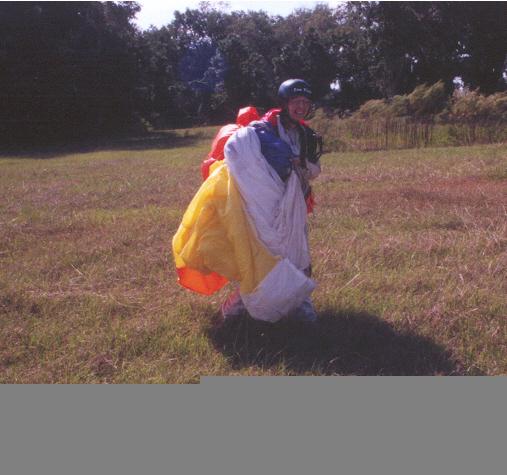 Coming in for her first parachute touchdown. "It was so much fun," Sam exclaims, grinning, as she walks back to the packing area. 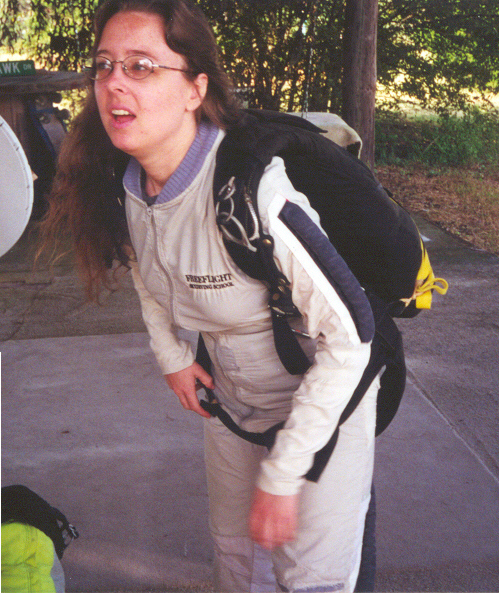 I give Sam a congratulatory hug after she sheds her gear. What a day! Postscript: Sam went on to graduate from the AFF student progression and has made a total of 17 skydives.